Thanks to everyone at ITEC that tried out the newest W.Nirschl tubas. Though some really liked the mouthpipe angle on the J-870, it was not unanamous. Both J-870's sold and there are two more due soon the same way. Thanks to several players that posed for pictures, it appears that the next change should be a 20 degree move to the players right and 10 degrees up. Betwixt the J-880 and J-870, players were divided nearly 50/50, and adamant, as to which played better. I was surprised by the intensity of opinion and it was divided among top notch players. 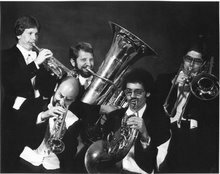 As to the J-880, it remains unchanged from Walter’s design and is popular with those who play Walter’s 6/4 tuba. It likes to be on a pad. J-700 continues to be declared the unanimous best BBb on the market. Thanks for your support. Tell your local band director so your high school students will show up with good equipment. See the ITEC pictures at the link on the right and thanks for your enthusiastic support.